Brazilian Agricultural Research Corporation – EMBRAPA, Agricultural Research Institute – INIA Chile, National Agricultural Technology Institute – INTA Argentina, University of Sao Paulo – USP and Sao Paulo State University – UNESP, are proud to announce the 7th GGAA – Greenhouse Gas and Animal Agriculture Conference to be held from August 4th to 10th at the Hotel Golden Park Internacional Foz Convention and Events Center, in the city of Foz do Iguassu/PR. 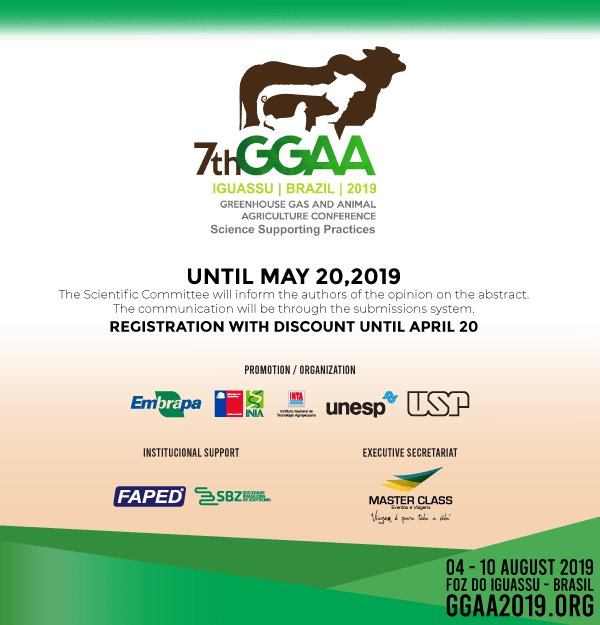 This is the premium international event on the subject of greenhouse gas emissions due to animal agricultural practices and takes place every 3 years, moving from continent to continent and 2019 will mark the first time in Latin America. Know the places of accomplishment of the theoretical and practical activities. Would you like to be a sponsor of the event? Contact us.